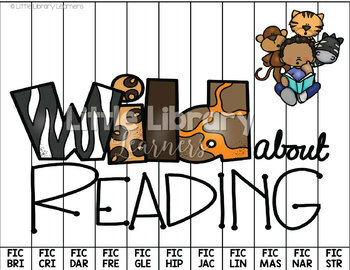 This set of Library Call Number puzzles has everything you need to get started in teaching students how fiction books are ordered. 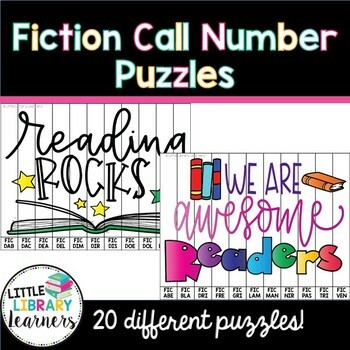 It includes 20 different fiction call number puzzles, each with a reading themed word, saying or quote. 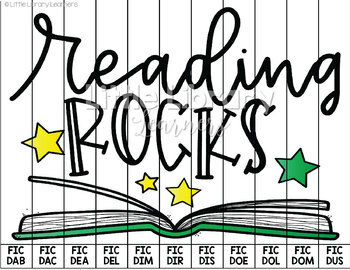 Students will refine their alphabetical order skills, while also learning how books are shelved and what is featured on a call number. These colorful and inviting activities are a fun, hands on way to teach students how to order a fiction call number. ★ Look for the green star next to my store logo and click it to become a follower. You will now receive email updates about my store. • By leaving feedback you will gain credit to use on future purchases. Go to your My Purchases page. Beside each purchase you'll see a Provide Feedback button. Simply click it and you will be taken to a page where you can give a quick rating and leave a short comment for the product. Each time you give feedback, TPT gives you feedback credits that you use to lower the cost of your future purchases. • Please note, this purchase is for single classroom/home use only. Multiple licences are available in my store. ✉Please don’t hesitate to email me at littlelibrarylearners@gmail.com before leaving feedback if you have any questions or concerns. Visit my Website and sign up to gain access to my free resource library!